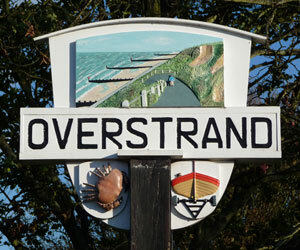 Overstrand is one of those peculiar names that almost always inspires visitors to this delightful old North Norfolk village to ask if it actually means anything. The name has its root in the old Saxon tongue (and from there in the even older Nordic) – where ‘strand’ was the word for the part of the beach left exposed after the tide had gone out. Therefore, Overstrand would seem to indicate that the place was up or above the strand – i.e. the place overlooking the beach at low tide! As with many of the ancient villages in this part of East Anglia Overstrand can trace its origins back to pre-Norman invasion times. Consequently, it is mentioned in the Domesday Book but its heyday was during the late Victorian to Edwardian period when it became a highly popular holiday destination for many of the great and the good of their day. As a result of this even today it carries an air of gentility and quiet style which visitors find very appealing. To add to its unique charms the village is located in the middle of an official Area of Outstanding Natural Beauty – a protection well awarded to the many breathtaking views and idyllic country scenes to be found all around Overstrand. 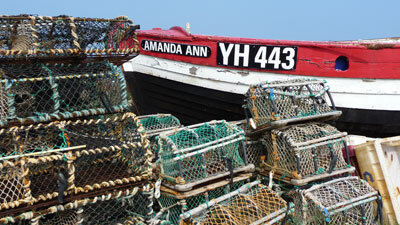 Being situated in North Norfolk Overstrand is just 2 miles from the ever-popular seaside town of Cromer, with its expansive beaches and possibly, the best fish & chip shop in the country: Mary Jane’s! 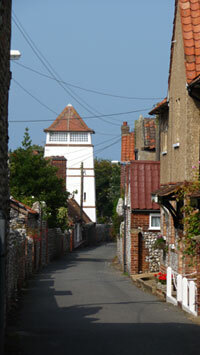 Overstrand also claims a connection to the best known Prime Minister in British History – none other than Sir Winston Churchill. In the late 19th century, whilst the future wartime leader of Britain was still only a boy, his mother, Lady Randolph Churchill was a frequent visitor to North Norfolk. 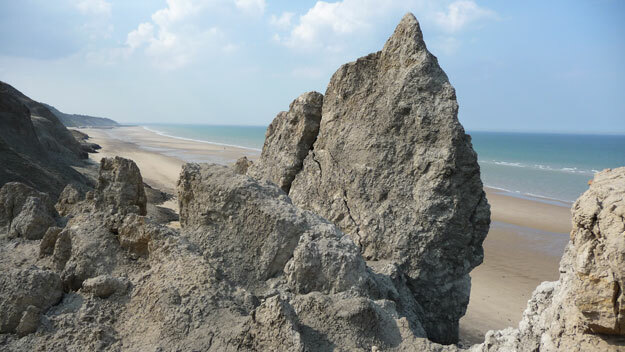 In the years leading up to the First World War she made many trips to Overstrand and it was in 1914 that her eldest son, Winston, came to visit her here – he even spent a pleasant day playing with his children on Overstrand beach. The best hostelry in Overstrand is without doubt The White Horse – Conveniently situated in the centre of the village and just 500 yards from the beach it has not one but two restaurants, a games room, beer garden and a fine selection of the essential liquid refreshment. Perhaps if you do decide to imbibe a little before venturing back to your holiday cottage it might fortify your courage in case you meet that dread spectre of the Norfolk – Black Shuck! Local folklore holds that the phantom dog roams the lonely country lanes and by-ways of Norfolk after dark and it was once said that he had made his home in the ruins of the local church of St. Martin’s before it’s restoration in 1911. The original Overstrand village sign actually featured Black Shuck but it has been many a year since he has been spotted now – or perhaps he was only ever just a shaggy dog story! This is a perfect place for building family memories. Jerry, Lesley & twins, Herfordshire. A wonderful cottage, great holiday. A first visit to Norfolk and what a good choice! Absolutely cracking stay, the cottage was perfect and we had a great time. Fabulous holiday – home from home. The Kidder clan, South Yorks. What a beautiful cottage,beach, village & suprise suprise weather! The writer and journalist, Clement Scott, is generally believed to have first coined the term, ‘Poppyland’ in 1885. Following the arrival of the Great Eastern Railway at Cromer in 1877, Scott made a visit to north Norfolk and strolled from Cromer westwards along the cliff tops. 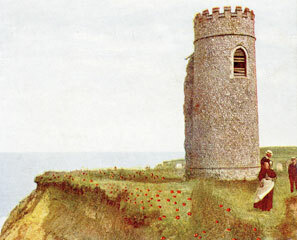 He eventually ventured beyond Overstrand and discovered a tower overhanging the cliffs, surrounded with graves and poppies. On a beautiful sunny day, the scene must have been extremely picturesque and became the inspiration behind his verse, ‘A Summer Song’. In the verse Clement refers to the tower and its surroundings as ‘The Garden of Sleep’ in his ‘Poppyland’. And so the legend of Poppyland was born. What Scott has actually discovered was the abandoned tower of St Michael’s Church, Sidestrand. The church nave had been moved inland (to its present site – see photo further below), brick by brick. A new tower was constructed. The abandoned tower became known as Craske’s Tower, named after the Overstrand brick-layer who had built it (following the fall of the original tower in a storm in 1841). Interestingly, the new tower, which can still be visited today) was modelled on the ‘pre-Craske’ version and so bears little resemblance to the tower we often see pictured in old photographs and post cards (as above). ‘A Summer Song’ by Clement Scott. God planted a garden – a garden of sleep! It is there that the regal red poppies are born! They are mine when my Poppyland cometh in sight. It is there I remember, and there I forget! I am waiting for thee, in the hush of the corn. From the Cliff to the Deep! I wait for the living, along with the dead! At whose feet are green graves of dear women asleep! Did they love, as I love, when they lived by the sea? Did they wait, as I wait, for the days that may be? Ere death gave release, and the poppies gave rest? By the graves in the grass, I am waiting for thee! In the Dews by the Deep! The photograph below shows the most likely location of where Clement Scott’s Poppyland lies today – on the beach, due to ongoing coastal erosion. It’s a short beach walk to this location from Overstrand promenade. Photo taken between the groynes of Overstrand and Trimingham, with Overstrand promenade just visible in the distance.